The idea for this talk came to me because so often when I present quilts that I have made, I am asked something to the effect of, "Did that come out of your head?". Like music composition is to me, I like the end product but would have no idea where to start. And this is the same challenge to many quilter makers. The purpose of this talk is to share my process, step by step, and the sometimes linear, sometimes circuitous path I take to end up with my quilt designs, highlighting the inspirations and obstacles that pop up along the way. My hope is that this talk will demystify the process for others and encourage them to start designing their own quilts. Examples from several of my designs are included. In this talk — intended for non-quilters as well as quilters — I share what led me to walk away from a high-powered entertainment marketing career to pursue my passion of quilt designing, making, lecturing and teaching. I highlight the joys and challenges of my drastic career change. The talk ends with a trunk show of a dozen or so of my quilts. The workshops I teach feature quilts I have designed. And all these patterns are available online via my shops on Etsy.com (at this link) and Craftsy.com (at this link). This workshop involves making a pieced background, fussy cutting flowers (from floral fabrics), adding cut stems and then fusing down & raw edge appliquéing all the flower heads and stems to the background. The class project finishes at about 24" x 24". I offer three American flag quilt patterns -- each a variation on the original. 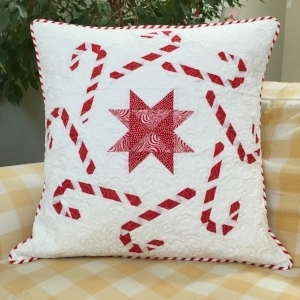 This one features wonky stars and stripes made in a rail fence pattern. Like all of my flag quilt patterns, this one finishes at 26" x 40", but could be larger if a group was interested. This quilt project combines the methods of the previous two workshops. The field of flowers is made via raw edge appliqué, using flowers fussy cut from floral fabrics. The stripes are made from splicing together dark and light floral fabrics in a rail fence pattern. This quilt finishes at 26" x 40". 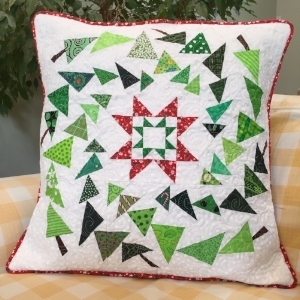 This is a great workshop for all quilters but especially for beginners, featuring simple and straightforward assembly using pieces all cut at the same size. It's a fun quilt featuring the primary and secondary colors set off by black & white fabrics. This quilt finishes at 36" x 36". This quilt is an exercise in using black and white to set off a third color. It uses time-honored quilt motifs -- stars and flying geese -- with contemporary fabrics. It measures 48" square. This quilt is a tweak on my first flower flag. The field of flowers is again made via raw edge appliqué, using flowers fussy cut from floral fabrics. But this time, the stripes are made from large print floral fabrics, matching the fabric repeats in the wider stripes. This quilt finishes at 39" x 60". This quilt features an aerial view of a beach scene. Each umbrellas is sewn and then appliquéd on top of a block of four beach towels (with sand in-between them). The blocks end up in the quilt at 6-1/2" x 6-1/2". This quilt finishes at 31" x 38-1/2". Of course with additional blocks and/or increasing the size of the blocks, it could be as big as you like. 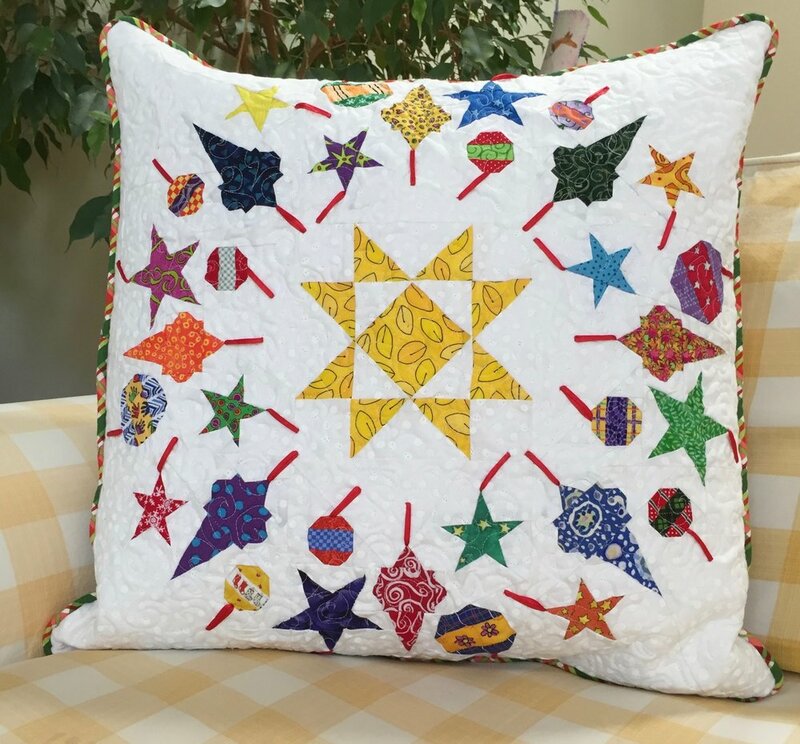 This quilt features very colorful stars set against black and white background fabrics. The contrast really makes the stars pop. This quilt is a blend of a traditional quilt motif (the sawtooth star) and contemporary fabrics. It finishes at 48" square. This workshop features several variations on a herringbone quilt. Participants can choose to make either a 20" quilted pillow or a 40" x 50" quilt. The look of the piece will vary based on the fabric chosen, the placement of that fabric and use of all skinny strips, all fat strips or a combination of both. This quilt is constructed using the paper piecing technique. It can be made either in this full size (50" x 50") or in a smaller class sample size, using fewer elements (24" x 24"). I have patterns for both. This quilt is my spin on the time-honored house motif in quilting. This quilt is made using paper piecing and regular piecing. This quilt finishes at 36" x 36". I offer three American flag quilt patterns -- each a variation on the original. This one features a stylized set of stars in the field and repeating eight-pointed stars in the stripes. The quilt is made via paper piecing. Like all of my flag quilt patterns, this one finishes at 26" x 40", but could be larger if a group was interested. This quilt is also constructed using the paper piecing technique. And it too can be made in one of two sizes -- either in this full size (48" x 48") or in a smaller class sample using fewer elements. I have patterns for both. I offer three American flag quilt patterns -- each a variation on the original. 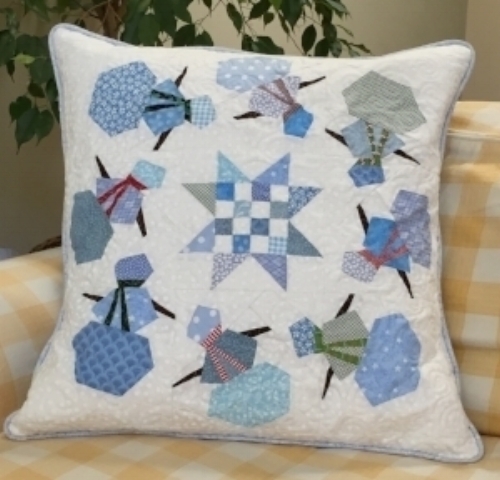 This version combines elements from the other two -- it has the stylized eight-pointed stars in the field (made via paper piecing) and stripes made in a rail fence pattern. Like the others, it finishes at 26" x 40", but could be larger if a group was interested. This quilt earned 1st prize in the show theme category at my guild's "Home is Where the Quilt Is" quilt show. The houses are paper-pieced and, once sewn into the quilt, measure 2" x 2". And yes, there are 100 houses in the quilt, surrounded by a picket fence made via raw edge appliqué. This quilt finishes at 24" x 24". If making 100 houses is too daunting, you could make a smaller piece with 25 homes and the picket fence that finishes at about 15" x 15". Due to the small size -- and large number -- of pieces in these quilts, I would not recommend this workshop for beginning quilters. 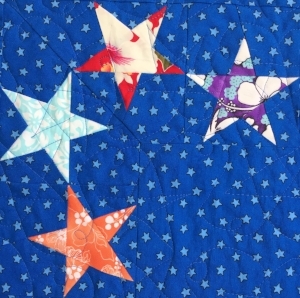 This quilt features 96 stars arranged in three rings. It is made via paper piecing and there are Y seams in the pattern -- but only 12. If your guild is comfortable with Y seams -- or wants to learn how to do them -- this would be a great opportunity. The quilt can be made smaller by making fewer rings of stars (or making the rings square instead of oblong). As shown, the quilt finishes at 55" x 63". This quilt features three sizes of California poppies arranged in a landscape orientation. It is made via paper piecing. The quilt can be made smaller by making fewer sections (as seen below the quilt photo). As shown, the quilt finishes at 25" x 40". My California Poppies quilt can be made narrower or wider depending on how many sections of the quilt top you make. This quilt was my 2015 Christmas card quilt, measuring 60" x 60". I offered my own block-of-the-month program in 2018, releasing the pattern for each 18" block over the course of nine months. 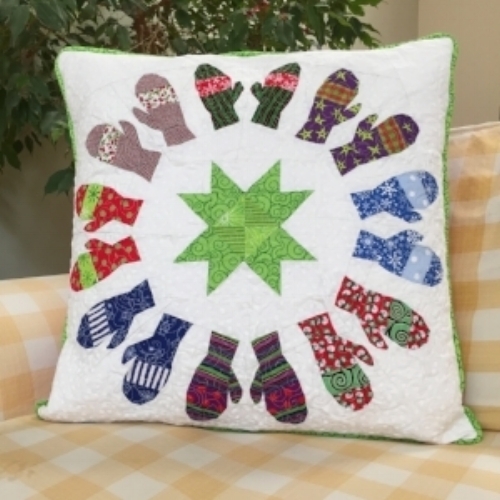 The individual blocks can be used in quilts or, as seen below, made into 20" quilted pillows.